Vitalics is a small business internal control system that provides all the tools necessary to easily set up and implement your company’s or clients’ bookkeeping controls. Vitalics contains over 140 already created yet customizable internal control forms, checklists and templates in easy to customize files or a desktop application. Whether you are a business owner, office manager, bookkeeper or accountant, Vitalics will provide you and your clients the reassurance that your work and your company assets are protected. As a professional bookkeeper, Vitalics is a value added service for your clients to make sure that the accountability and protection of your work is reviewed. Using Vitalics with your clients provides authorization steps and approval procedures so your client are directly involved in reviewing the financial records. 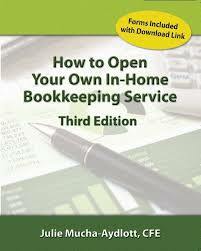 If you have ever thought about opening your own bookkeeping service but don’t know where to start, “How to Open Your Own In-Home Bookkeeping Service 3rd Edition” will guide you through all of the unanswered questions right at your fingertips. With over 19,000 copies sold world-wide, it is the most popular and trusted book to start your own bookkeeping service.